• 4 days of playing golf on the 18-tee (9 hole) Dragon’s Tooth Golf Course, between Ben Nevis and Glencoe. 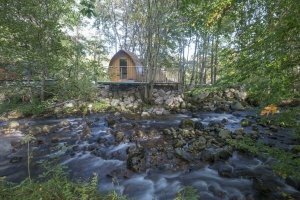 • 3 nights of luxury in a wee lodge with hot tub. The rate is just £142.50 per person for the 3 nights. That’s £285 for 2 people, 1 lodge, for the 3 nights (please let us know if you would like a twin or a double). If you can only stay 2 nights, then its a very special offer, too – £125 per person, or £250 for the lodge. To book this package, please call us (9am – 5pm) on 01855 413 006. Any questions or problems in relation to this remarkable golf package, or any questions on golf in Fort William and golf in Oban, then please call us on 01855 413 006. See you soon!